There were times when only a few companies were making laptop computers. They gave much thought to it and gained big experience. You can still see some of those old rusty machines running. Today, there are many manufacturers, but they have a long way to go and some basic things to learn. Take this photo for example. 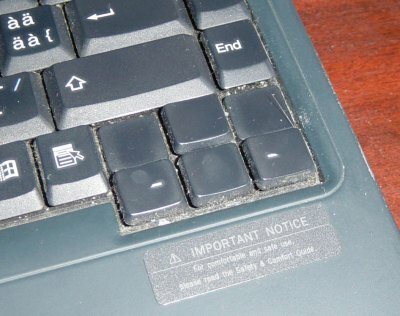 It’s my 5-year old Compaq Evo N160, and that’s why the arrows on arrow keys are not there anymore. It was my first notebook so, coming from a regular PC, I was a little nervous about small keyboard, lack of numeric keys, etc. I thought to myself: look, they even wasted two free places above the cursor keys (left and right one). It wasn’t until recently that I realized how genius this design is: I bought a new Asus A6000 series laptop. Very cool machine, and those two spots were used to Fn and Windows menu keys. First time I wanted to work at night - the problem has shown up: It’s darn hard to find cursor keys in the dark. Being a programmer myself, cursor keys are probably the most important ones, as you move around in source code all the time. Having to look where they are is a real pain. With old Compaq, my right hand would just go down until it finds those two empty spots. Working without it is a real pain. So, finally, few months later I couldn’t bare it anymore and I decided to yank out the Fn key - I have another one in the bottom-left corner of the keyboard anyway. Anyway, this example shows experience in some field is also important in hardware industry.